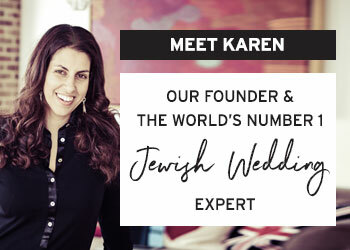 Get ready for goosebumps, because this quirky and creative Jew-ish real wedding is soooo beautiful that we actively scouted it, after bride, Laura, tagged this image on her Instagram with the hashtag #jewishwedding ! When two creatives come together (Steve is an online editor for a local city magazine, while Laura works as a copy editor and page designer for a local newspaper), the result is an unstoppable force of originality, expression and amazing attention to detail. 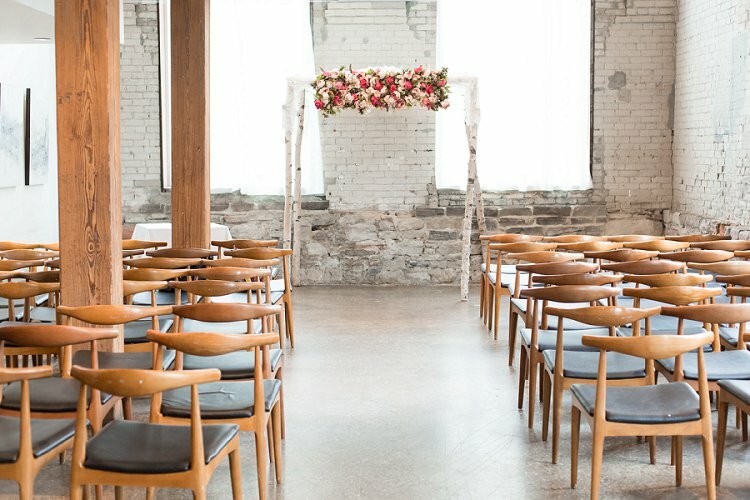 The industrial-chic vibe of Toronto boutique hotel, Hotel Ocho, was juxtaposed with a romantic, floral theme that saw fluffy, pink peonies take pride of place in wildflower-feel arrangements. 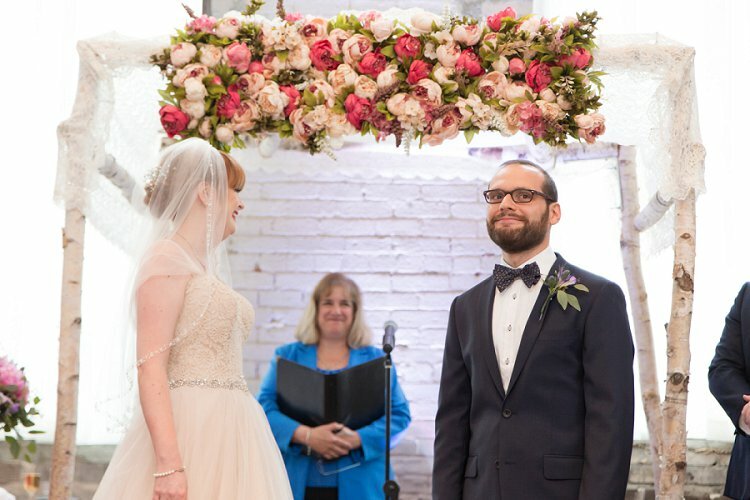 The stunning chuppah, which was built as a team effort by the couple’s family, was sprawling with beautiful silk blooms. 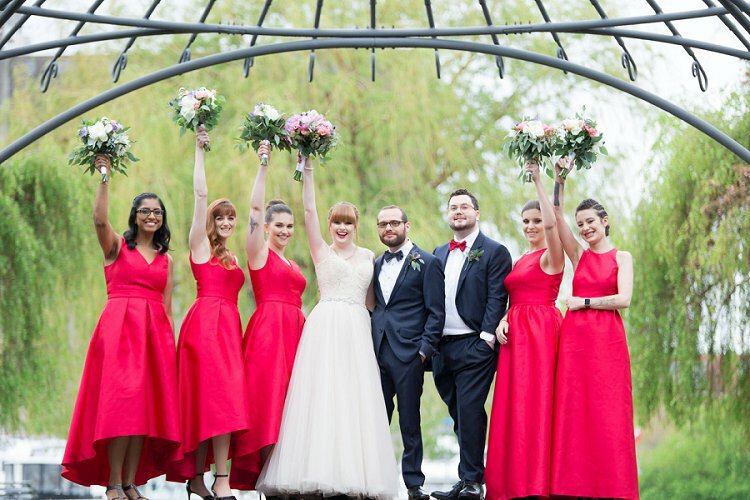 Everything about this bright and bold big day popped with color, from the bridesmaids’ and groomswomens’ dresses, to the bride’s breathtaking crimson lip and red hair combo. 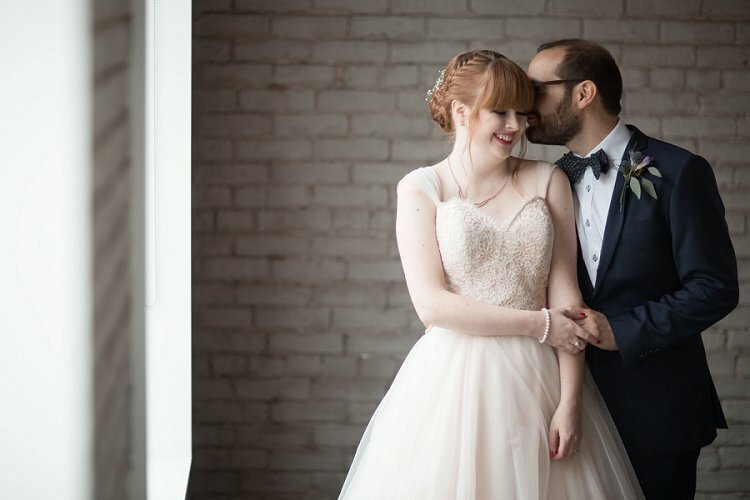 Laura looked every bit the Hollywood glamazon in her champagne-colored Allure Bridals ballgown. 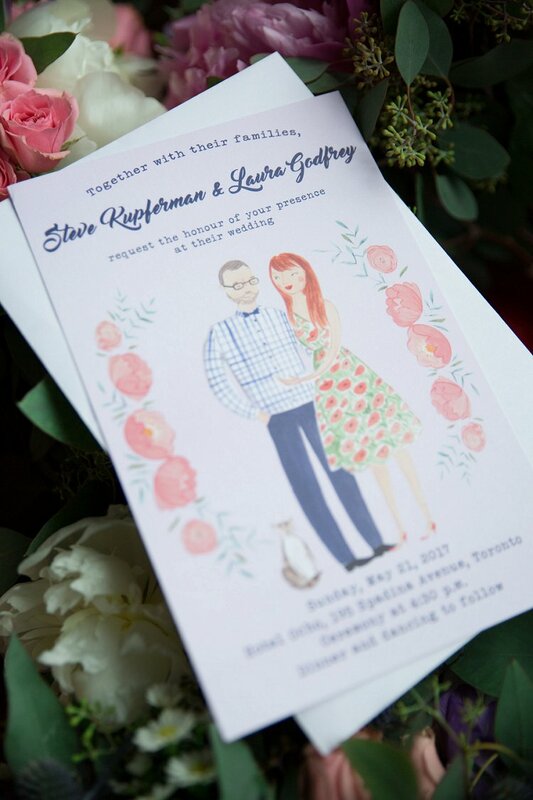 The wedding was peppered with personalized details, including illustrated invitations and simply the cutest cake topper! 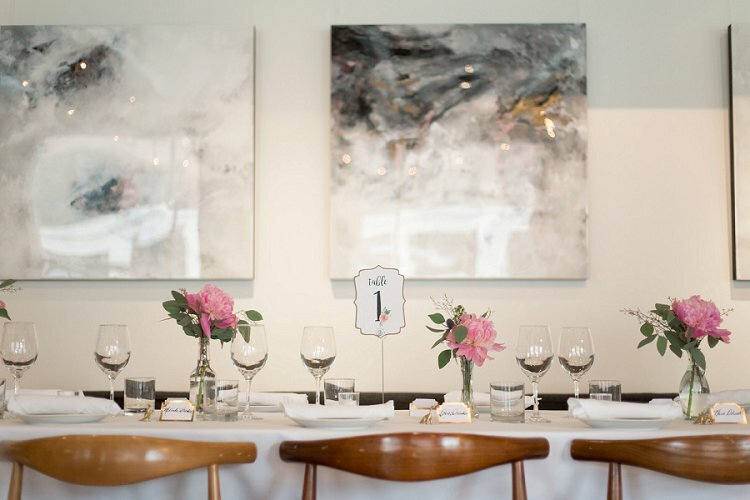 The whole thing came together in a pretty Pinterest-perfect palette. Speaking of which, you know what to do! 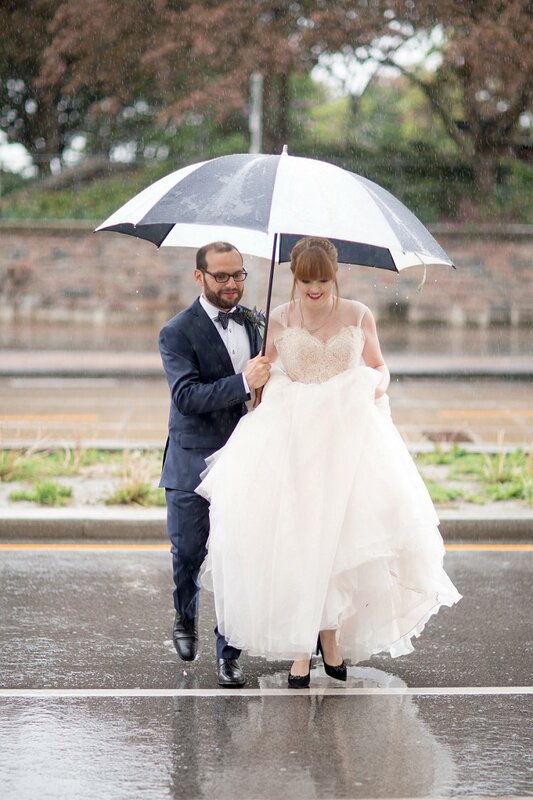 Every last detail, including some super romantic kissing in the rain, was captured by photographer Daniel Clements and, of course, writer Laura provided the most articulate and wonderful account of the couple’s big day. Enjoy, and don’t forget to leave some love in the comments. 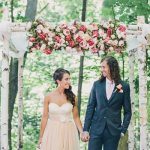 Laura, the bride: We met about six or seven years ago when we were both working for a news website called Torontoist – we both worked from home as freelancers, but we first met in person during a bar night at a journalism event. I was seeing someone else at the time, but Steve asked me out almost as soon as he heard I was single. The first time he kissed me was after a date at a Doctor Who-themed improv show at the Comedy Bar, and we still have the postcard from that comedy show up on our fridge. 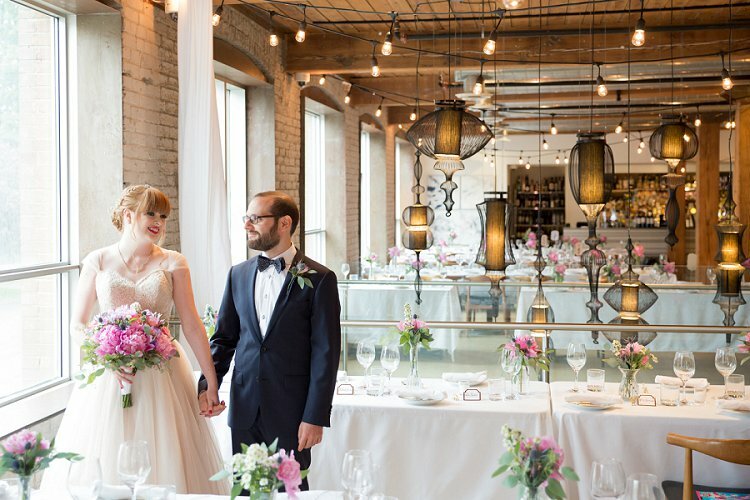 We got married on May 21, 2017, at Hotel Ocho, a boutique hotel in downtown Toronto with a bright, industrial-chic vibe – exposed brick walls, tall ceilings, and huge windows. 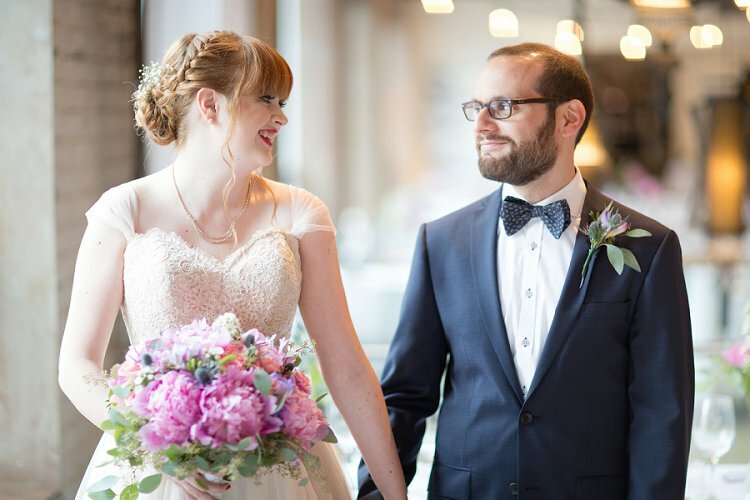 We both love the city we live in and wanted our out-of-town family members to be able to experience it while they were visiting – most of his family is from the U.S., and I had family coming in from England. 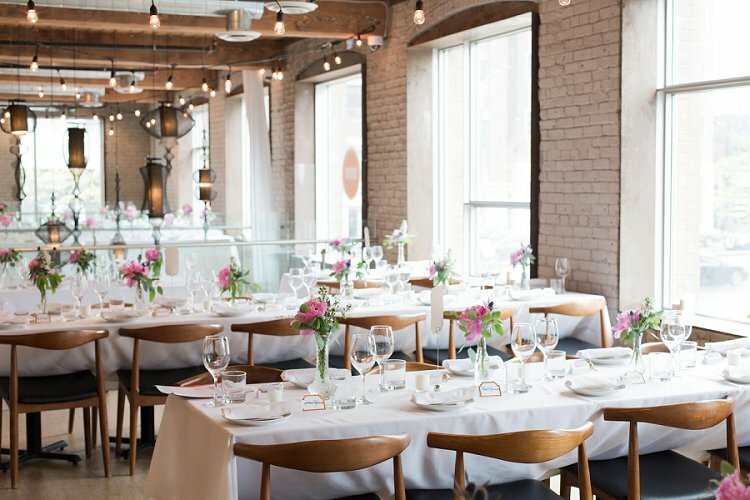 We visited a few other nearby venues on our search, but Hotel Ocho was the perfect combination of what we were looking for in terms of its size, vibe, and location – it’s only a 20-minute drive from where we live, plus it’s in the neighbourhood of Chinatown and Kensington Market, fantastic places for our guests to visit. 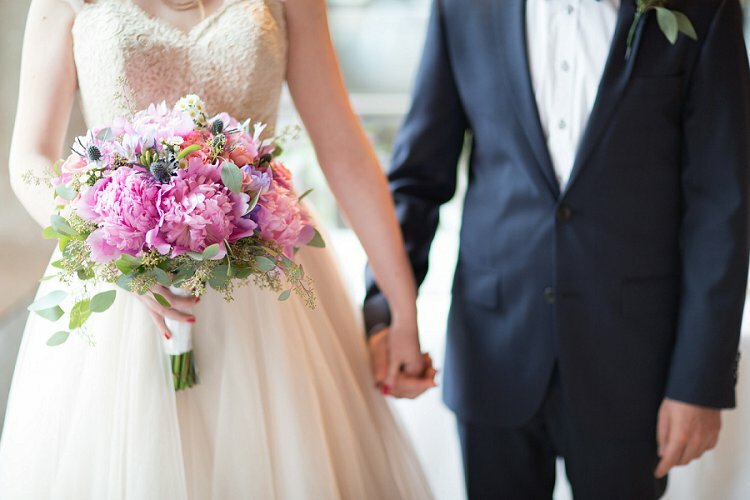 The theme of the wedding and dà©cor was romantic and floral. 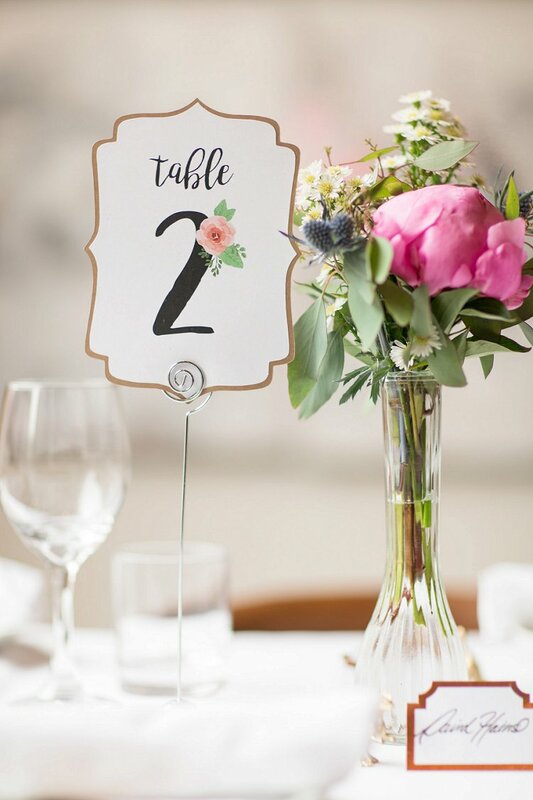 In addition to the pink peonies in my bouquet, we had pink peonies on the chuppah and the centerpieces, and images of the flower on our wedding invitations, table numbers, and the dinner menus. 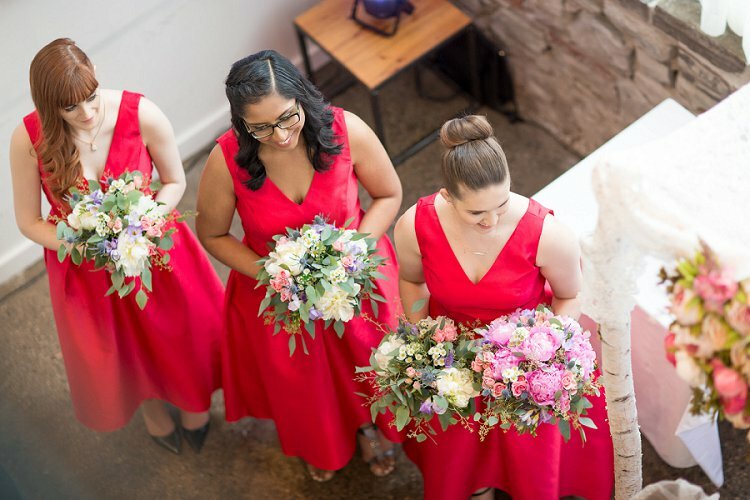 The color scheme was mostly pink and green, but I didn’t adhere to that too closely – the bridesmaids’ dresses and best man’s bow tie were red. 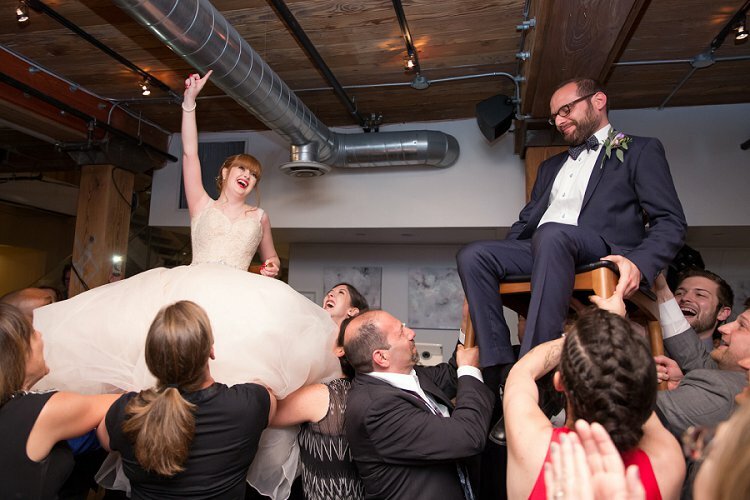 We didn’t use a wedding planner. 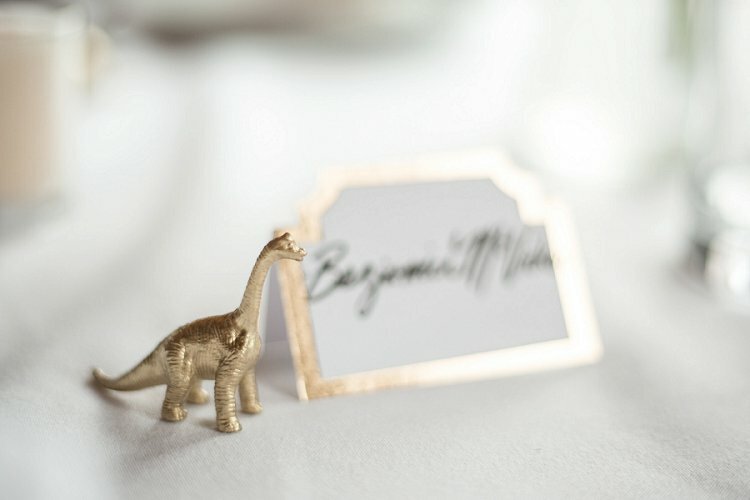 My favourite movie is Jurassic Park, so at each place setting, next to the name cards, was a little 1.5″-tall dinosaur spray-painted with a matte gold finish. It was a really fun and whimsical touch that was easy to DIY, matched my personality, and made people smile – and now we have a bunch of little leftover dinosaurs hanging around the house! Soon after we got engaged, I fell in love with the artwork in a children’s book written by Anne Michaels, called The Adventures of Miss Petitfour, about a Mary Poppins-like redheaded woman with 16 cats. I looked up the book’s artist, a UK-based illustrator named Emma Block, and months later, commissioned her to draw a portrait of me and Steve (and our tabby cat, Daisy). I then used that illustration as the starting point to design our invitations in Photoshop. On the back of the invitations, to showcase the neighborhood where the wedding would take place, I designed a map that highlighted the venue, our favorite restaurants, and nearby landmarks. 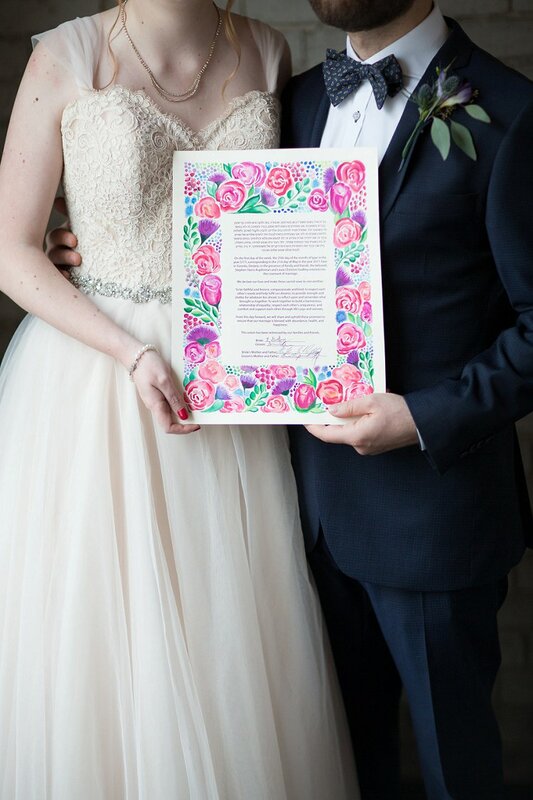 The map was a combination of Photoshop and my hand-drawn doodles, and I received so many compliments on the invitations. We had them printed through Vistaprint, because they have huge sales and great customer service, and I chose the linen-feel paper to make them a little nicer. We saved so much money with Vistaprint! I also got a custom rubber address stamp made by a local shop called Kid Icarus. 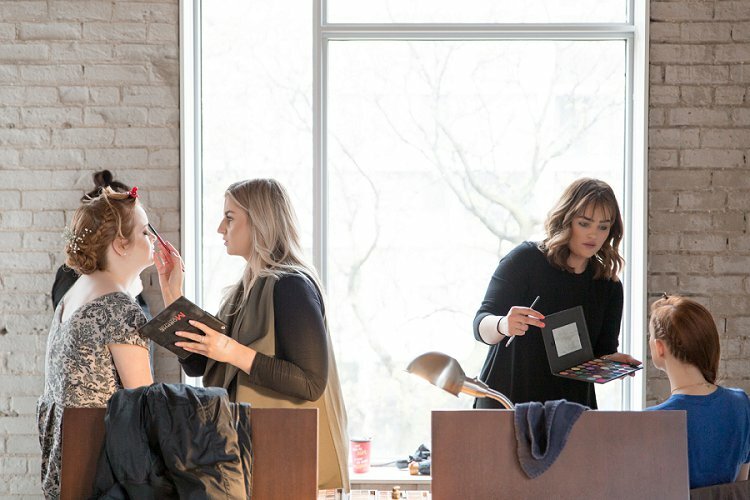 Choosing my hair and makeup team was a no-brainer. 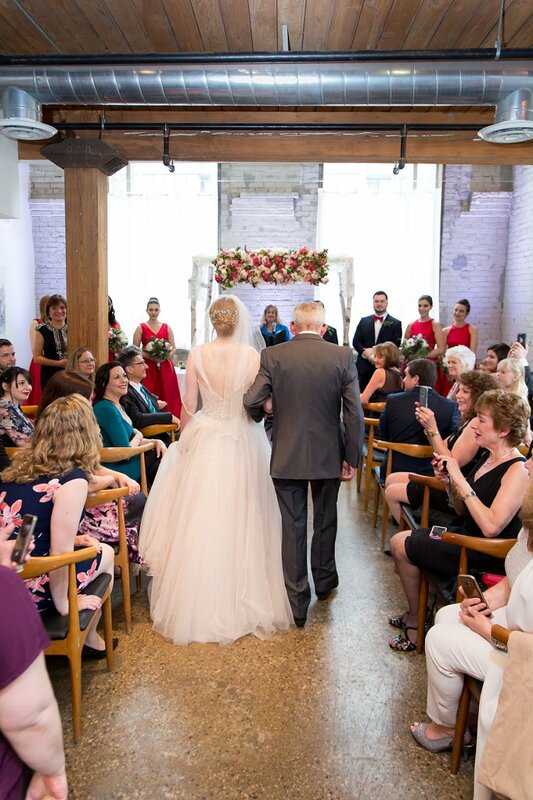 I was so happy to discover that not only did my regular hair salon, Citra Hair Studio, book weddings, but they were available for our date and priced within our budget. 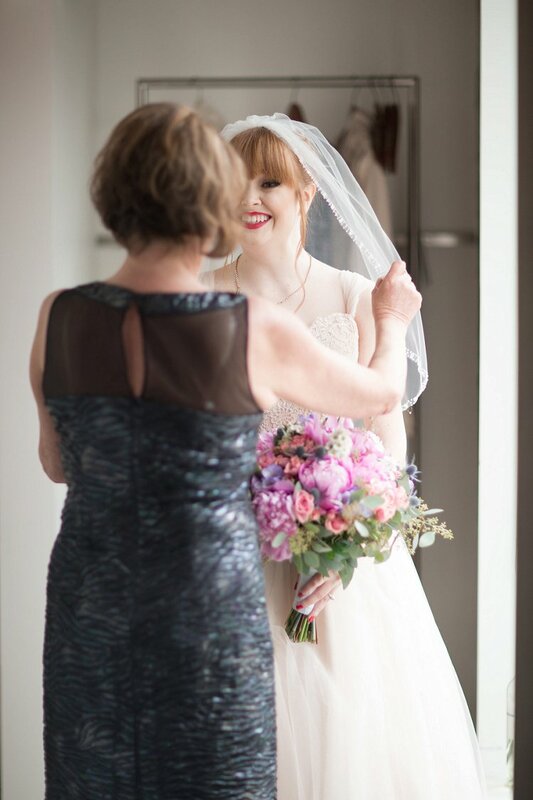 Katherine has been my hairdresser for several years now, and I felt so confident knowing that she would be there (along with the talented Blair and Suzan) to help make me and my bridesmaids/groomsladies look extra beautiful. 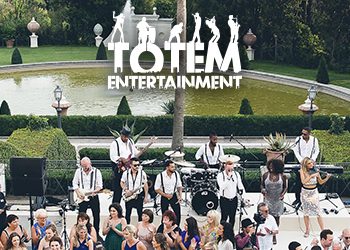 Not to mention, they really helped to make the whole morning of the wedding even more fun, with music and great energy! I wanted my look to be spring-y to match the season, while still being a little glamorous by incorporating my favourite lip color (a bold and bright crimson), and having a swoosh of dark eyeliner and eyelash extensions. 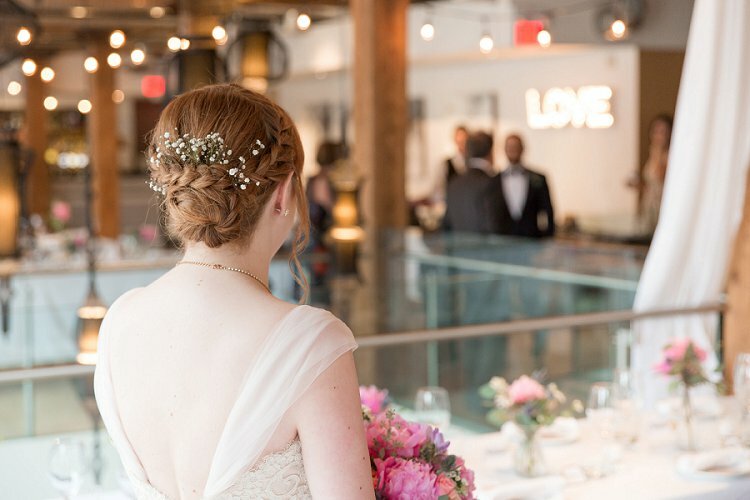 I wore my long red hair in a low bun, with a french braid along each side of my head, and a couple of sprigs of baby’s breath placed on top of the bun. 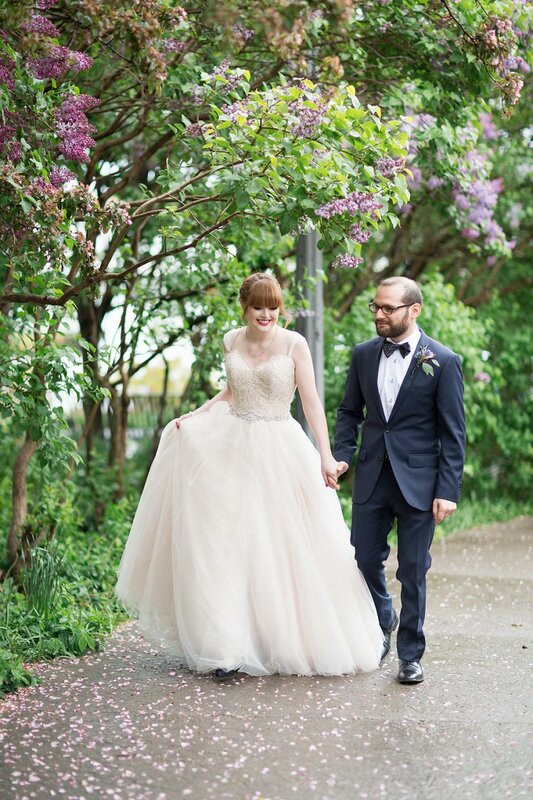 My dress was a champagne-colored, strapless ballgown with a beautiful pattern on the lace bodice (and I had the seamstress add tulle straps). 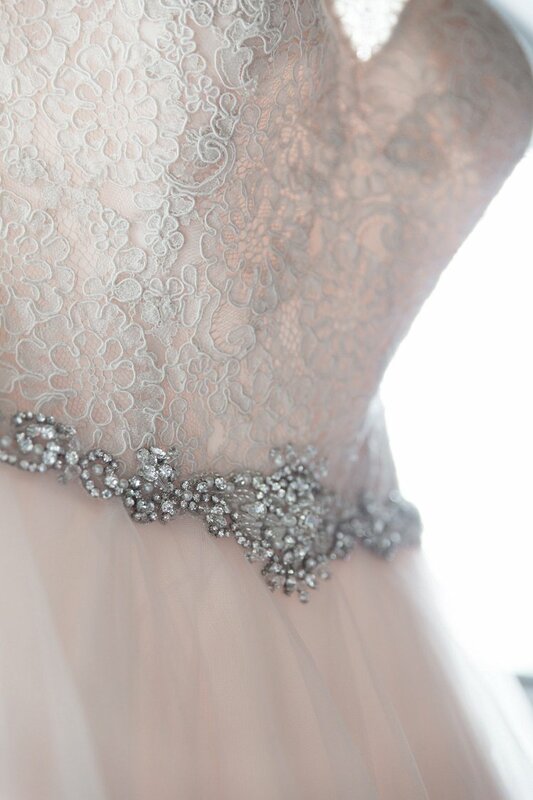 The dress is by Allure Bridals, and was purchased at the bridal salon Ferrà© Sposa in Toronto. My mom and mother-in-law both wanted to come dress shopping with me, so Steve’s parents came down to Toronto from upstate New York (where Steve is from). 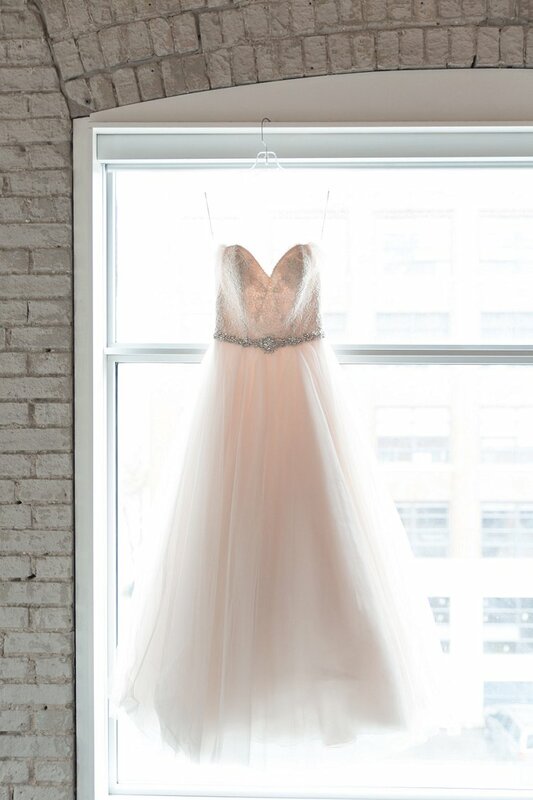 We made a whole weekend of it, visiting six shops in two days, and this dress just had that wow factor that made me feel like I was in a fairytale. 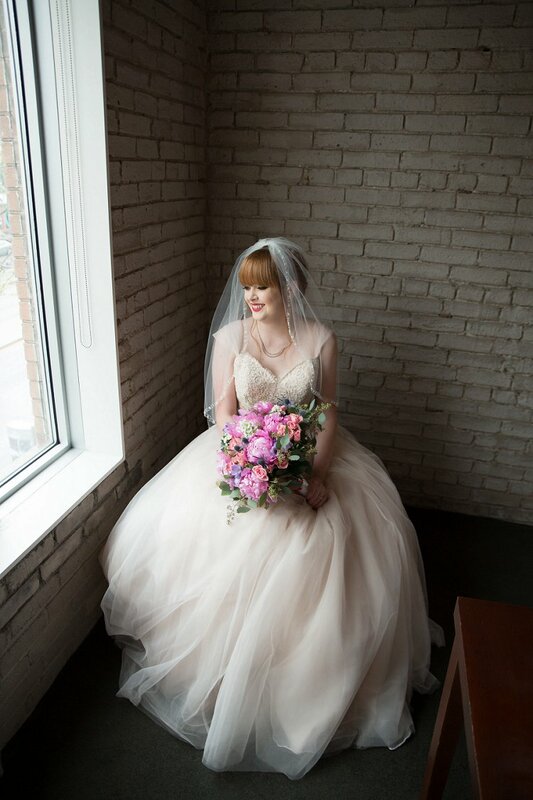 Anyone who knows me knows that I love wearing dresses, so this was such a fun experience for me, and the dress was just perfect. My engagement ring is very special, as it’s an heirloom from Steve’s family that belonged to his great-grandmother. The fact that his mom gave this ring to him to one day give to me was just another example of how openly they welcomed me into their large and loving family. It’s a white gold filigree ring from the 1920s with delicate floral engravings and a single diamond in the centre. 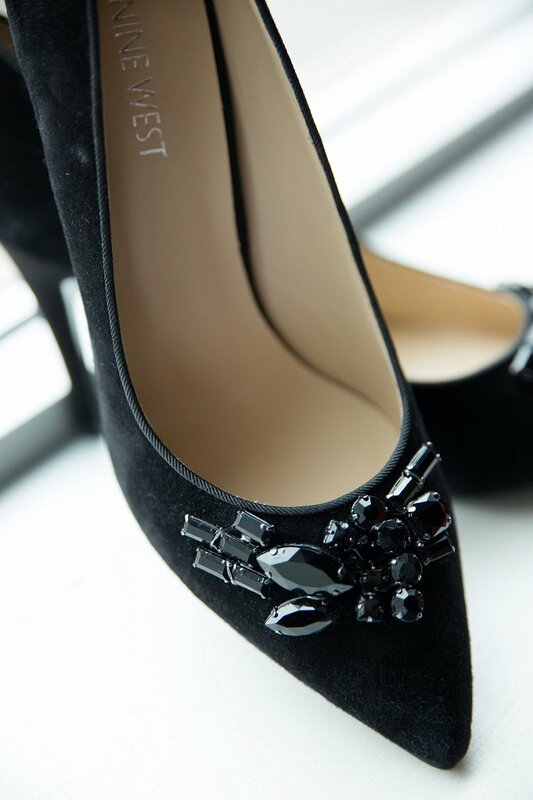 My shoes were 2″ black heels with a pointed toe and little black jewels on the front. I got them at a Nine West outlet sale, and I wanted to be a little practical, so I got the black colour so that I could wear them to other events in the future. 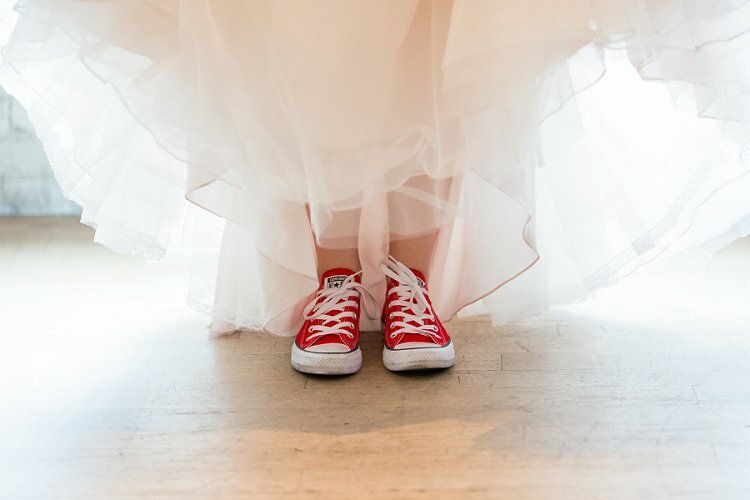 After the first dance and the hora, I changed into my dancing shoes – my red Chuck Taylor sneakers (which matched what our little ringbearer was wearing). I had to get one of Steve’s sisters to help me take off my other shoes and lace these ones up. 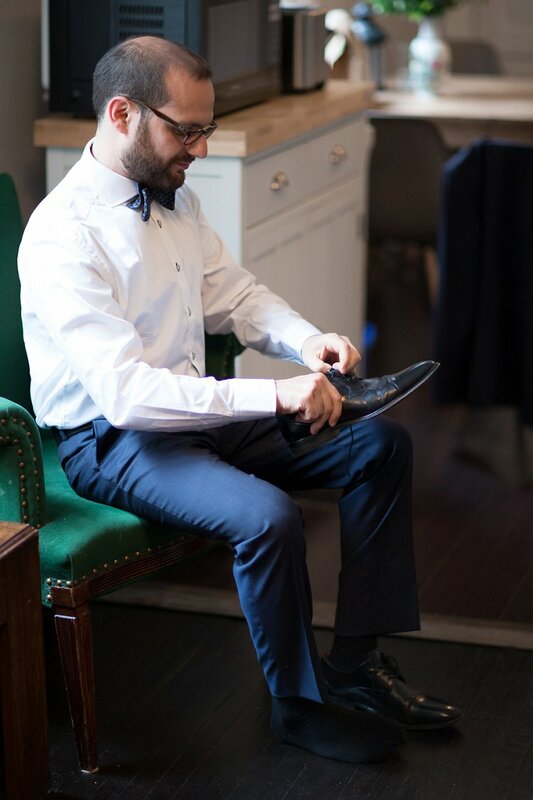 Steve wore a tailored navy blue jacquard suit from Sydney’s, a menswear shop on Queen Street West. 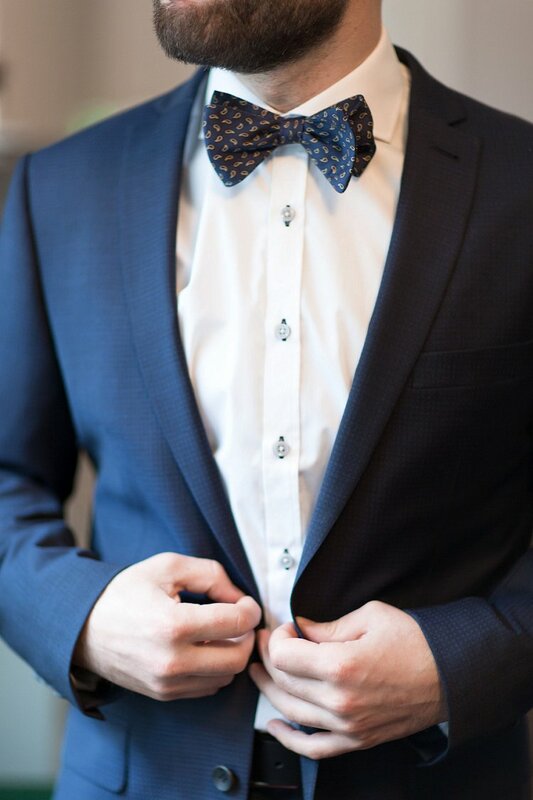 He also wore a bow tie, a style choice he inherited from his paternal grandfather (whom the family adorably calls Peep) – and in fact, this particular bow tie, a navy blue paisley pattern with crimson and gold detail, was a gift from Peep (who also wore a bow tie to the wedding). Steve’s (and my) good friend David was the best man, and it just so happened he already had the perfect navy blue suit to wear to the wedding. 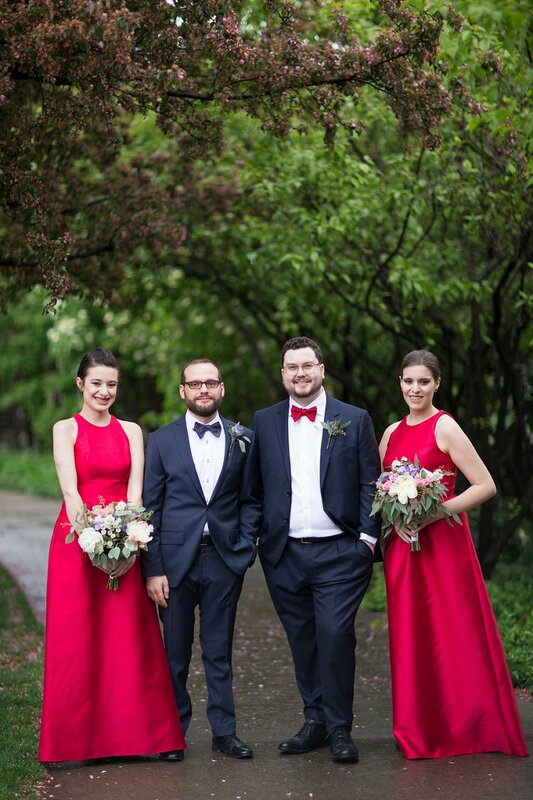 Steve gave him a red bow tie to wear, which meant David coordinated well with both Steve and the bridesmaids. 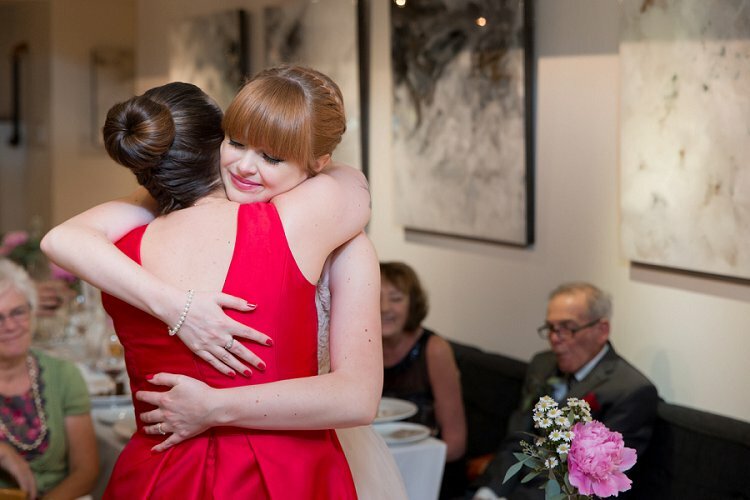 My maid of honor was my dear friend Allison. We’ve been friends since kindergarten, went to the same university, and now even live in the same neighbourhood, so she’s like a sister to me. My two bridesmaids were my good friends Zalina and Colleen, both of whom I met while working together on our university’s campus newspaper. The three of them, along with Steve’s two younger sisters, who were groomsladies, all wore long red dresses by Alfred Sung. 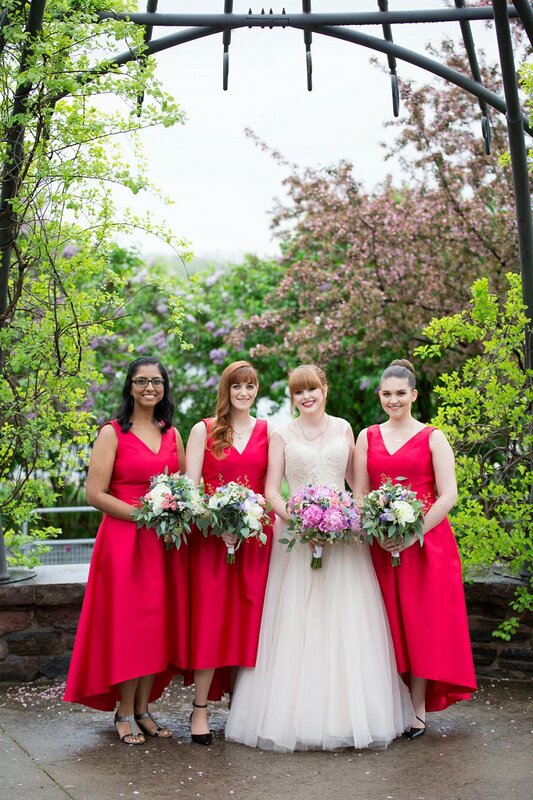 I wanted them to all feel comfortable and pretty but still be coordinated, so I gave them a designer and a color, and let them choose the style – and the bridesmaids all chose the same style (V-neck and high-low skirt), as did the groomsladies (bateau neckline and full-length skirt). I gave them each a pair of gemstone earrings by Rare Specimens from Coal Miner’s Daughter, a shop specializing in Canadian designers that’s co-owned by a woman who lives down the street from me. 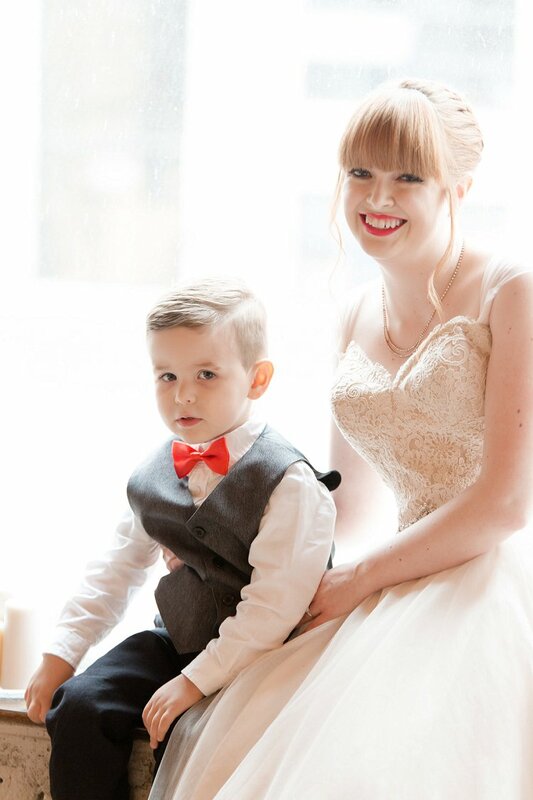 I have a little nephew, Liam, who’s almost three – my older brother’s kid – and I was so excited for him to be our ringbearer. I even gave him a children’s book I found that was written specifically to teach kids about a ring bearer’s role in a wedding. 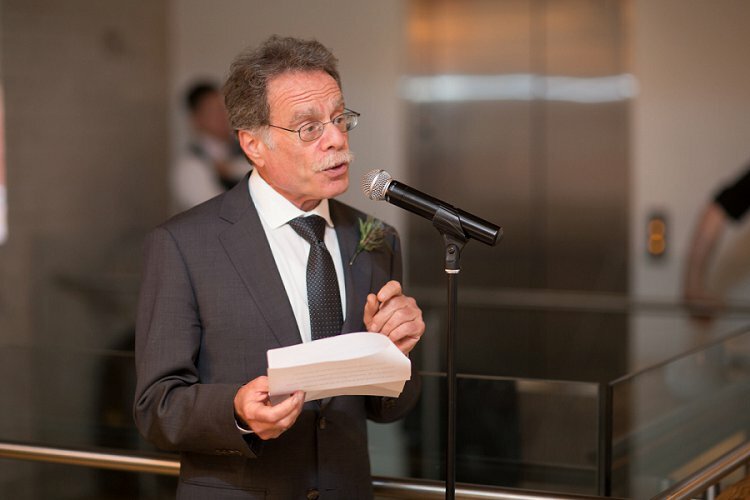 He looked so handsome in his vest and red bow tie, with little red Chuck Taylor sneakers to match. 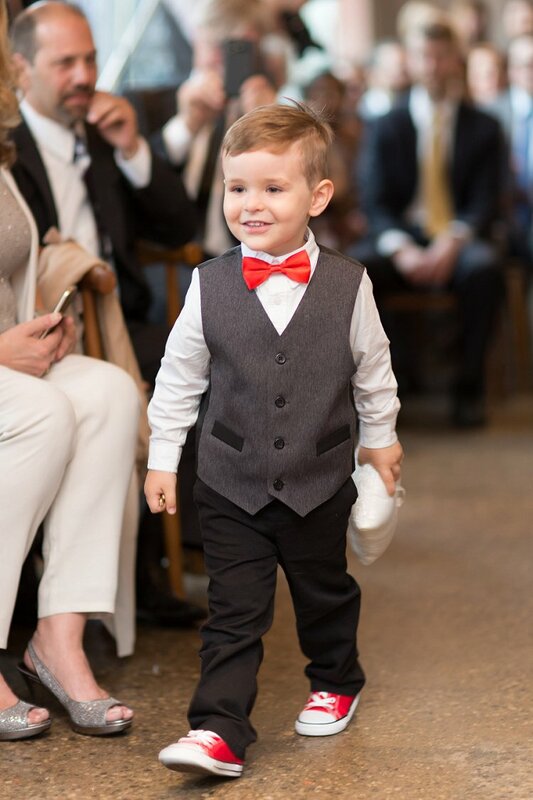 His mom was sitting in the front row of seats during the ceremony, waiting with a toy truck to trade him for the ring cushion when he got to the front. 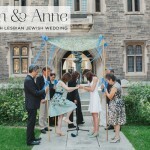 Our chuppah was very special because it was built by my dad. He’s a former engineer and talented at building and fixing things in general, and he graciously took on this important task for us. I asked him to use birchwood branches, because I love the natural look of them. 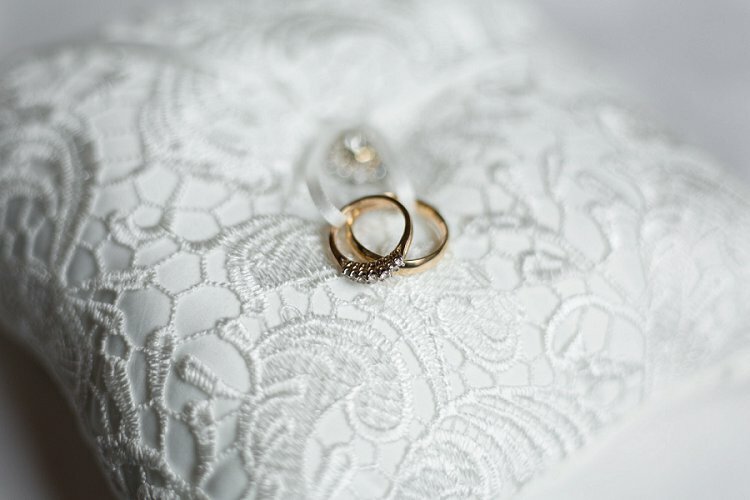 The white lace cover was chosen by Steve’s mom, and then sewn to fit by his aunt, Amy, so it was a real joint effort. 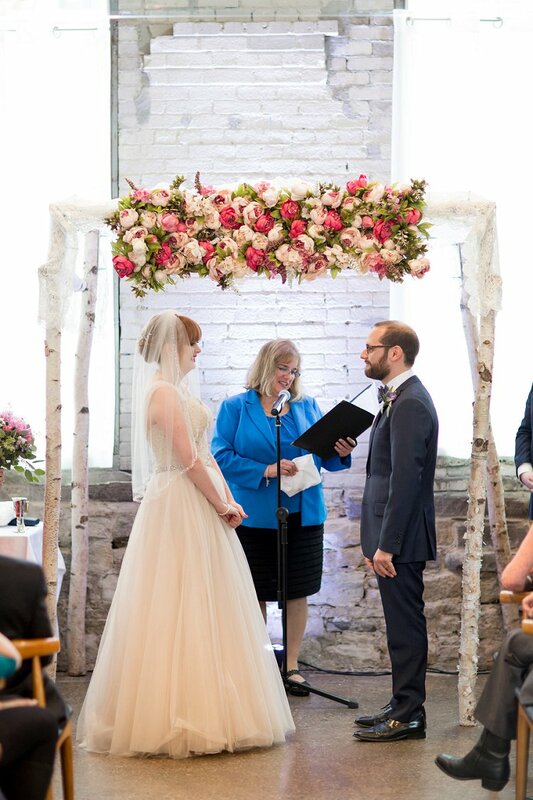 Finally, I came across a small local vendor called Dundas Valley Chuppah that was renting out silk flowers – and they had pink peonies! 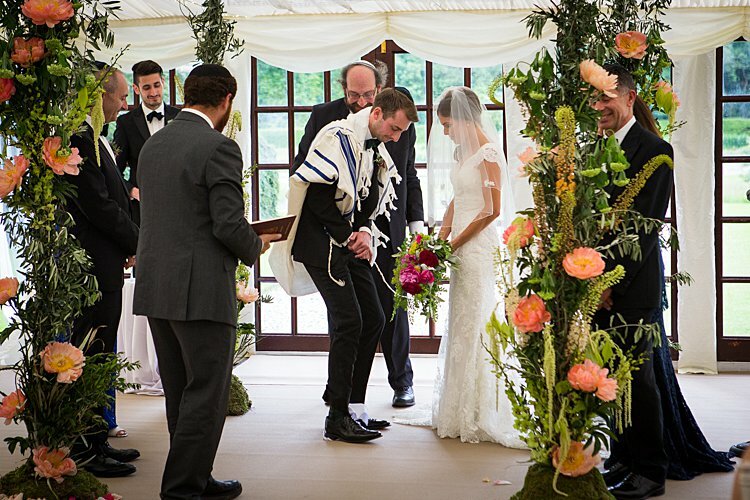 They were the perfect thing to finish off the look of the chuppah. 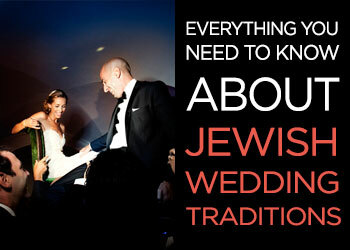 Steve is Jewish and I’m not, so we picked and chose which traditions felt right to us. 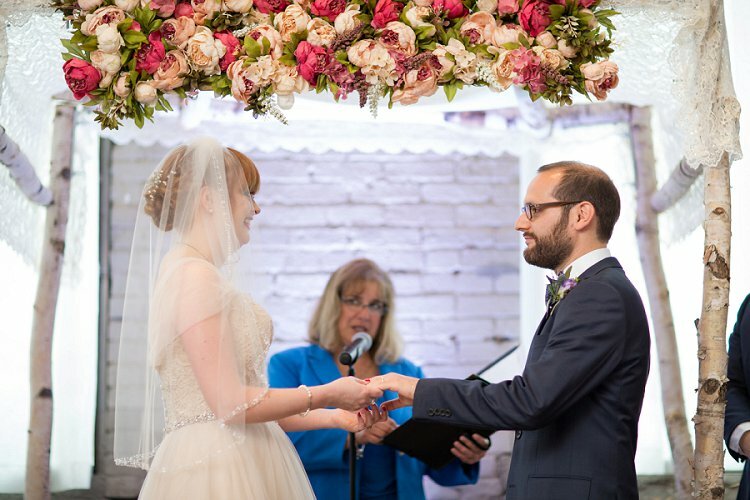 We hired Elaine Page, an amazing officiant who specializes in Jewish and interfaith weddings. She also has a great sense of humor, and believes strongly in egalitarianism between spouses, which was important to me. 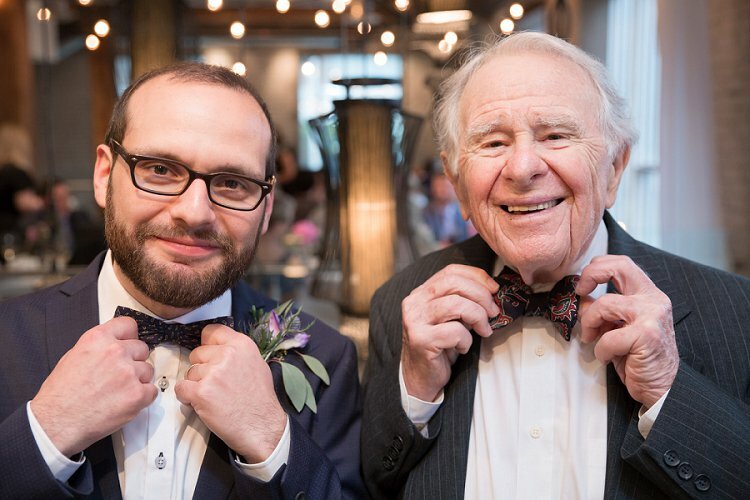 The first kiddush cup that we drank from during the ceremony was the one his parents had saved from his Bar Mitzvah, and the second cup was one we bought here in Toronto. 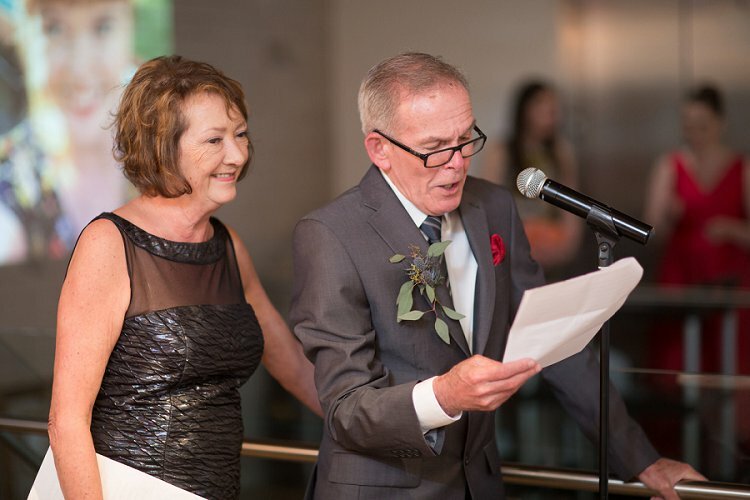 My favourite part of the ceremony, however, were Steve’s vows. He’s a great writer, and he made me laugh and get really emotional at the same time, reminiscing about the terrible apartment he lived in when we first started dating. 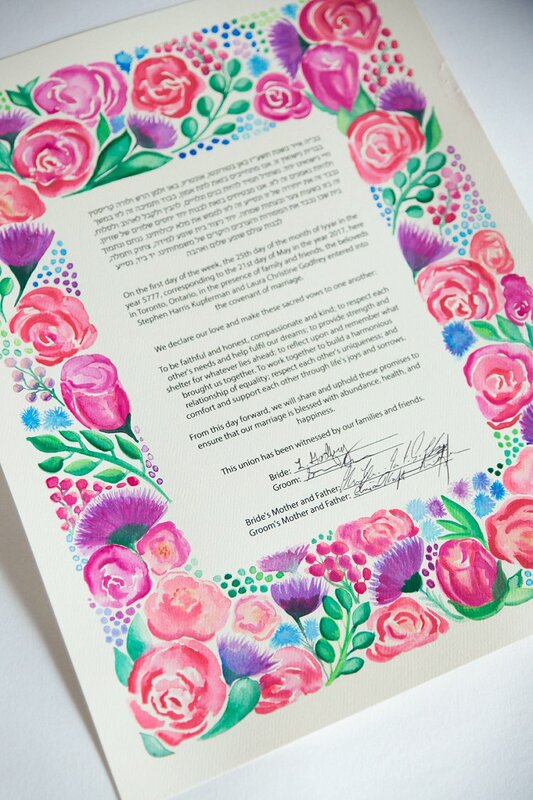 Our ketubah was created by Jenny Herbert of Ketubah Ink — she’s the daughter of my friend and occasional freelance employer, Marilyn, who made the ketubah her wedding gift to us. Jenny painted it to feature the flowers in my bouquet – pink peonies and purple thistles. She’s an incredibly talented artist and was such a pleasure to work with. 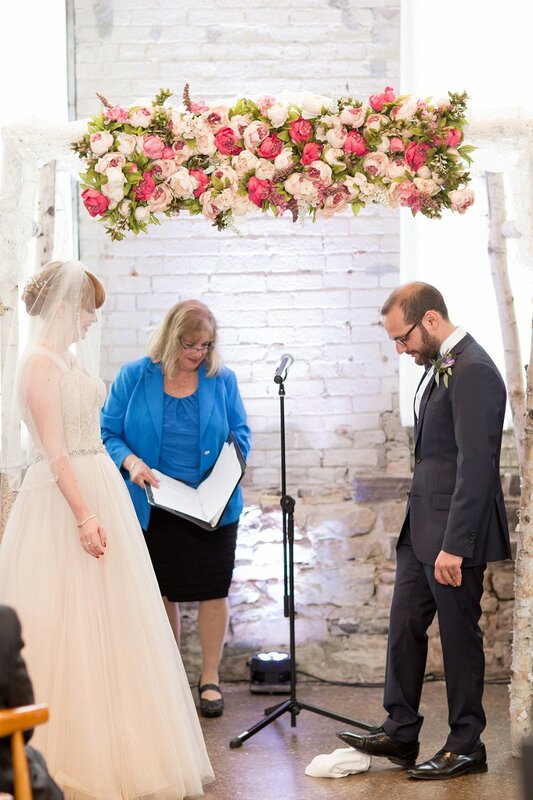 On the wedding day, we did the ketubah signing as a private event before the wedding ceremony, and had both sets of parents sign at the bottom. 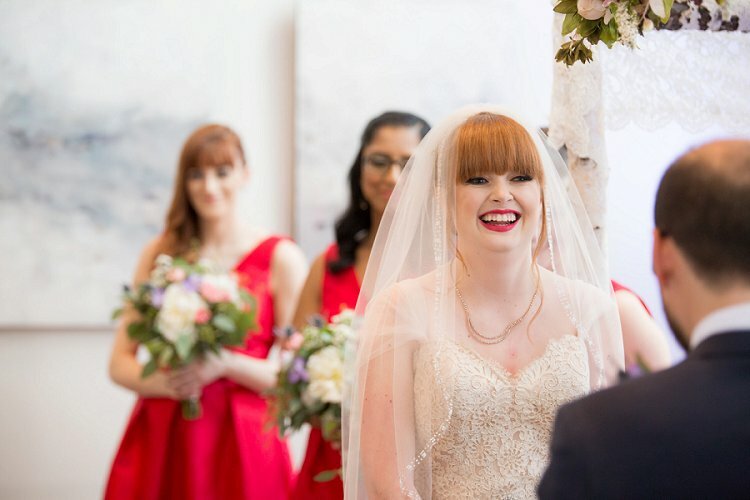 The bridesmaids and groomsladies walked down the aisle to an instrumental version of A Thousand Years by Christina Perri. 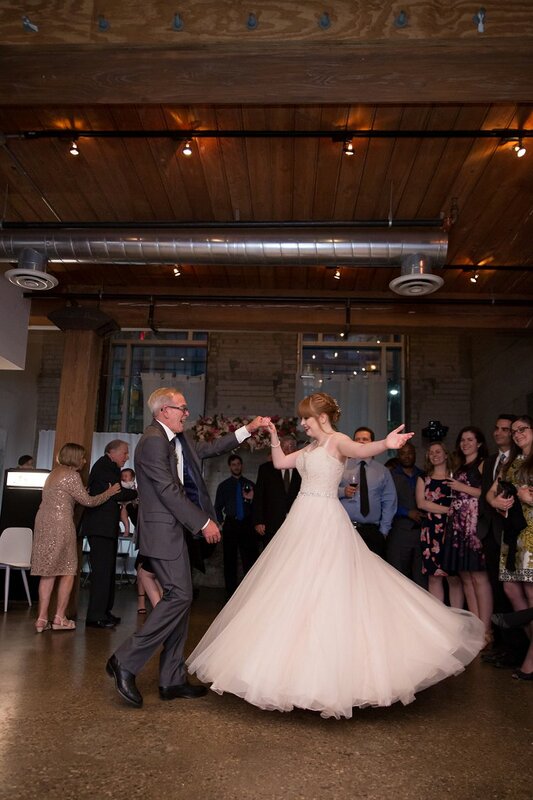 My dad walked me down the aisle to an instrumental version of Hallelujah by Leonard Cohen. 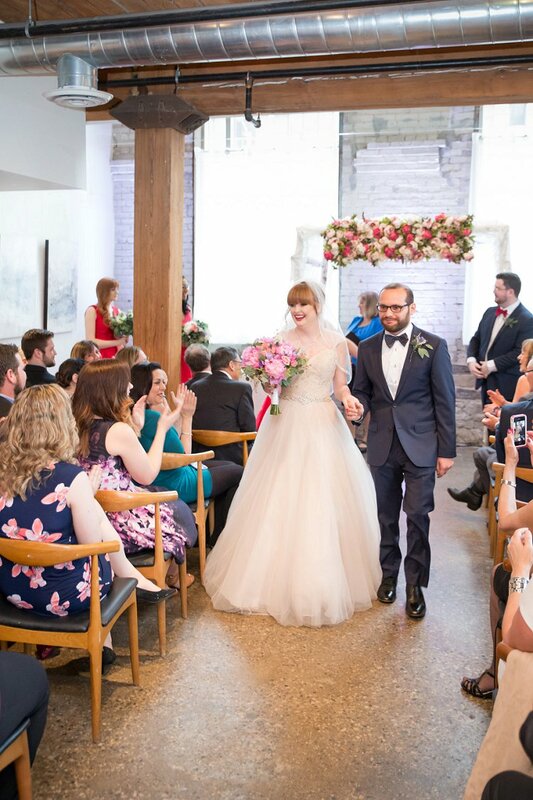 Our recessional song was You Make My Dreams Come True by Hall & Oates. 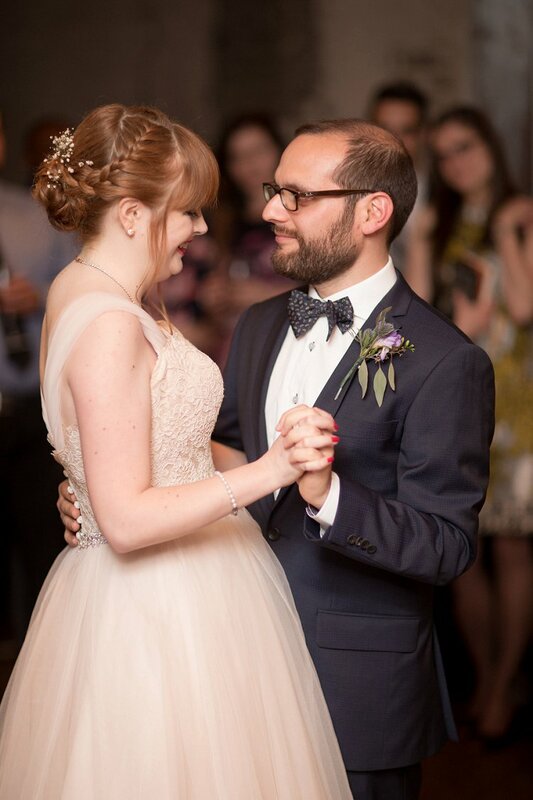 And our first dance song was Everything Has Changed by Taylor Swift & Ed Sheeran. 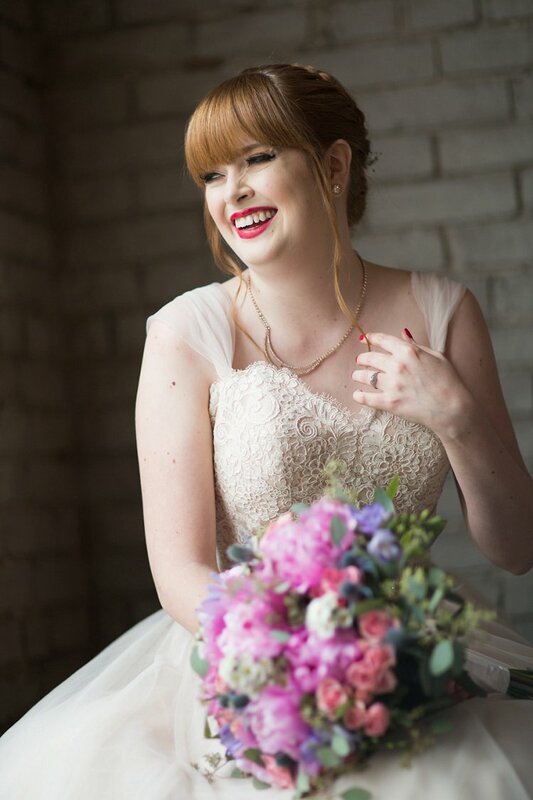 Our florist was Inna Byelova of Bridal Beauty First; she came highly recommended by my good friend Andrea. 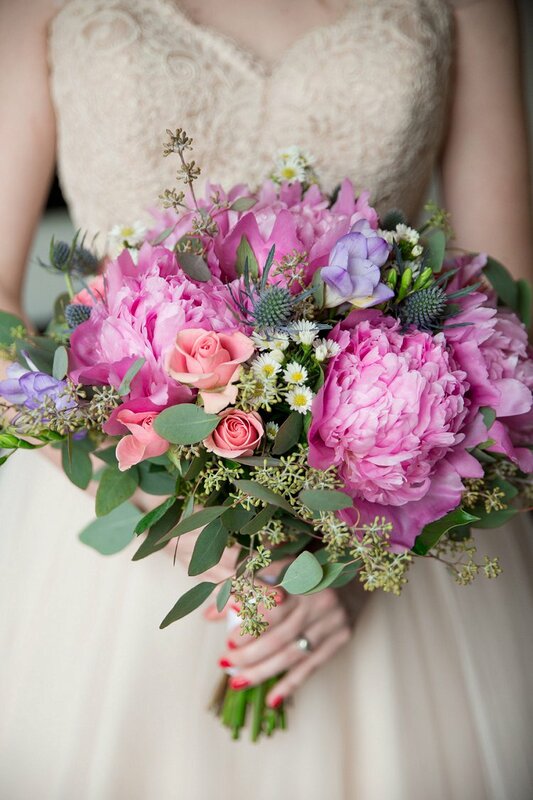 I knew that I wanted the main flowers in my bouquet to be pink peonies, but I also wanted it to have a bit of a wildflower feel, so she added some purple thistles, pink spray roses, purple freesia, and little white daisies – the latter was a tribute to our cat, Daisy. 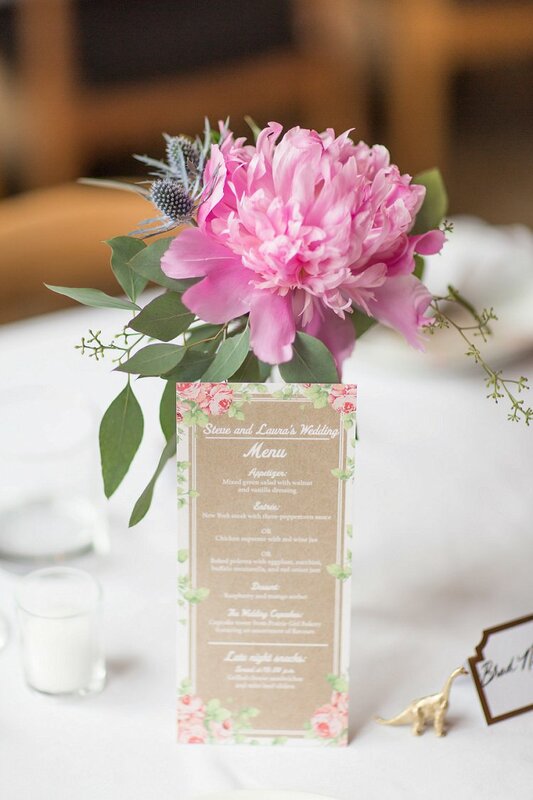 We also used peonies and thistles in small, mismatched glass jars for our centrepieces. 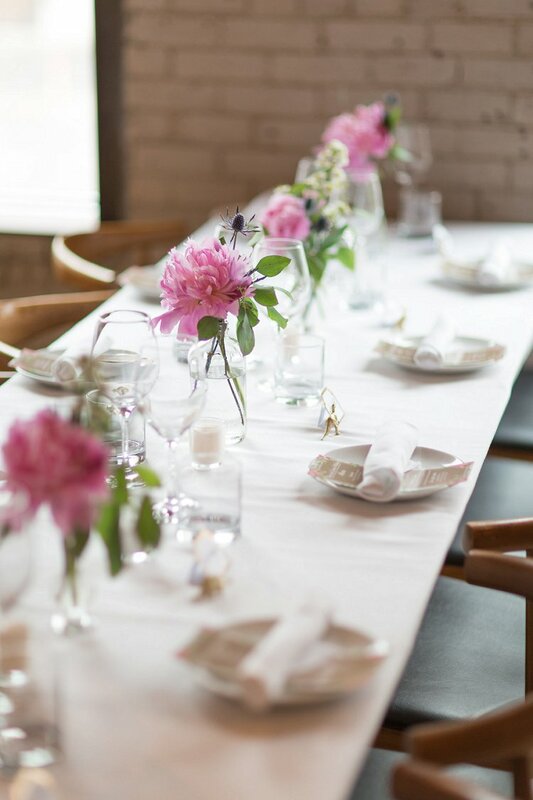 Instead of round tables we had long, rectangular ones, so the flowers looked lovely all in a long row on each table. 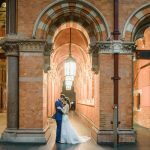 Our photographer was the supremely talented Daniel Clements, who I was lucky to meet at a bridal show early in the planning process. I absolutely loved his bright and romantic style and the mix of posed and candid shots; his talent and confidence show through in his images. His secondary photographer was Livi Shaw, who we were lucky to have as she’s extremely talented herself. 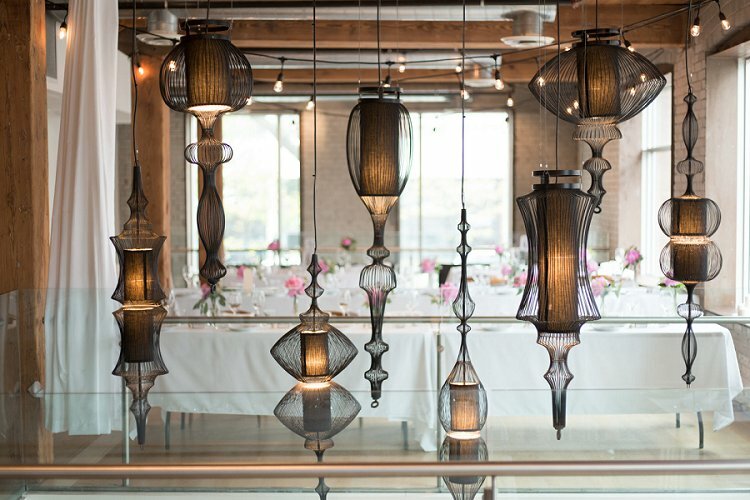 The catering was by Hotel Ocho, as they are a restaurant as well as being a wedding venue and boutique hotel. In addition to cocktail hour hors d’oeuvres and dinner, they also provided late-night snacks – mini grilled cheeses and beef sliders – which were a big hit, and went fast. Instead of a cake, we decided to go with cupcakes from my favourite cupcake shop, Prairie Girl Bakery. That way, we were able to choose multiple flavors: we got vanilla lemon, chocolate chocolate, red velvet cream cheese, and chocolate strawberry. 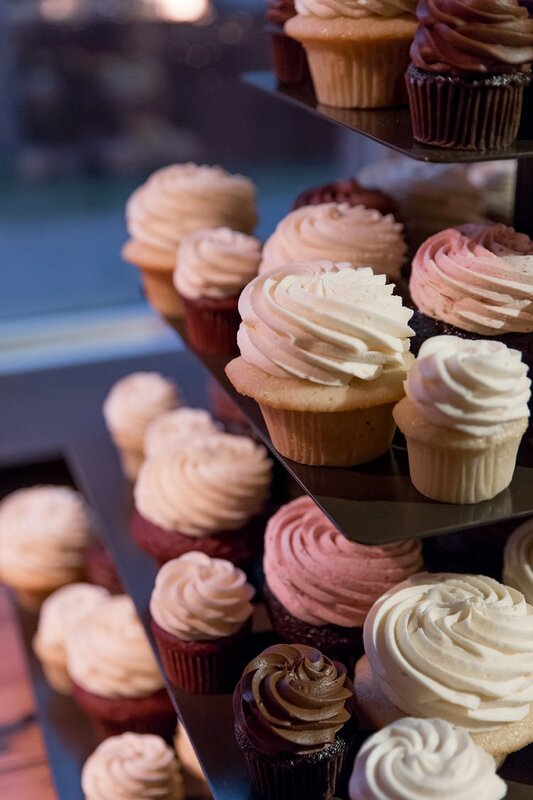 We had nearly 100 cupcakes, which were arranged on a huge bronze-colored cupcake tower. 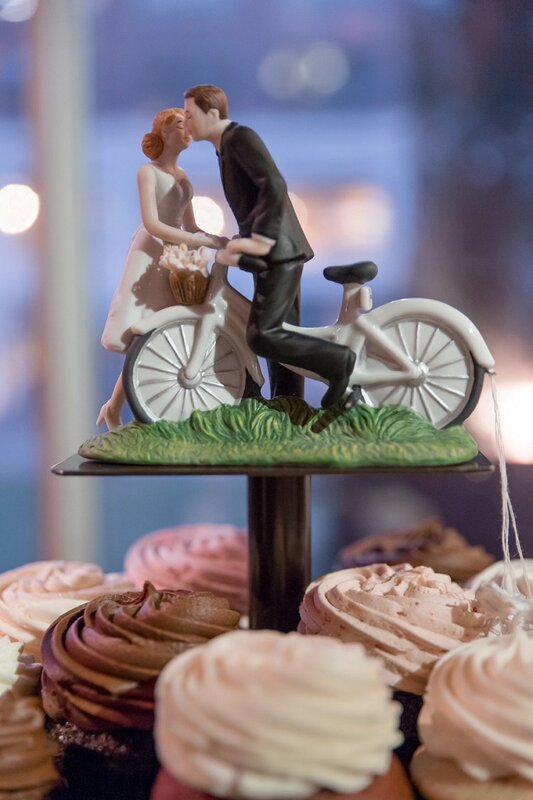 At the very top, our cake topper represented us perfectly: a porcelain figure of a redheaded woman in a white dress standing next to a brunette man sitting on a bicycle. Steve rides his bike around the city so much it’s practically a part of his identity. 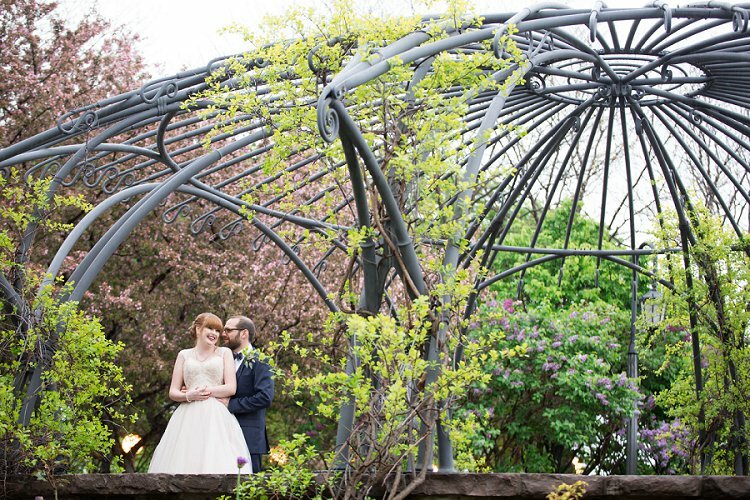 As the wedding day grew nearer, the weather forecast was predicting rain throughout the day, which was fine for our indoor wedding, except that I had my heart set on a post-ceremony photo shoot with Steve and the wedding party at the Toronto Music Garden. 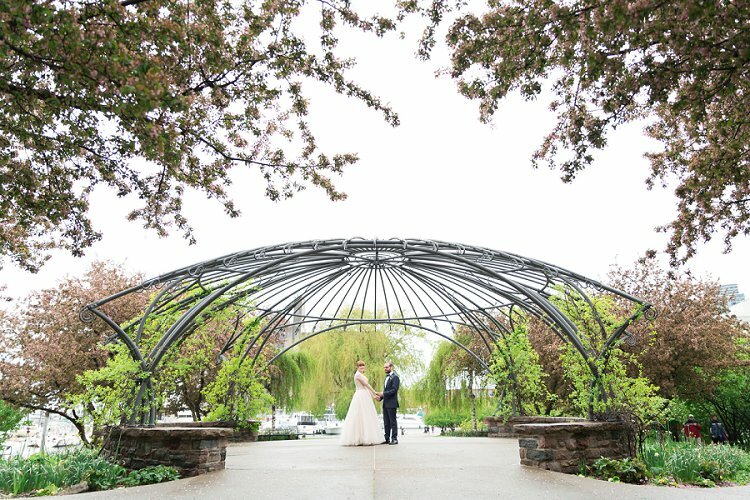 It’s an absolutely beautiful garden right next to Lake Ontario, co-designed by cellist Yo Yo Ma and landscape designer Julie Moir Messervy. 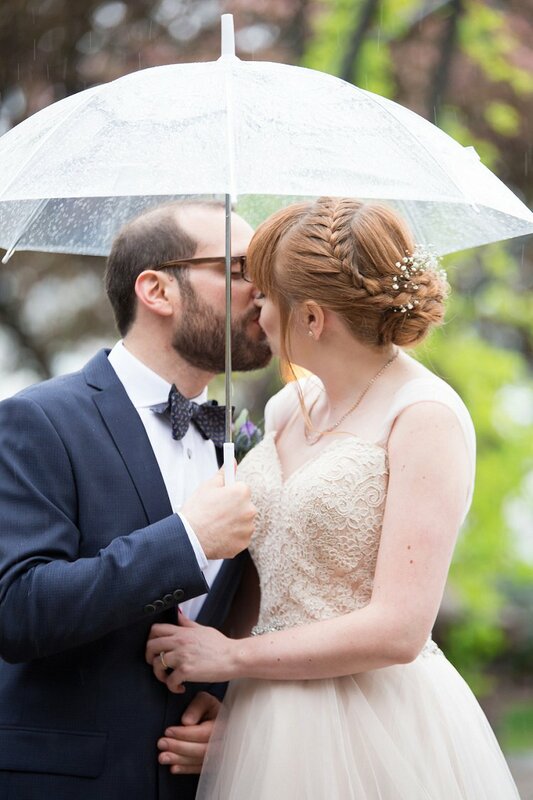 We were skeptical of the weather, but I was determined to get down there if possible, so we spent the last few days before the wedding borrowing umbrellas from our family and friends, just in case. 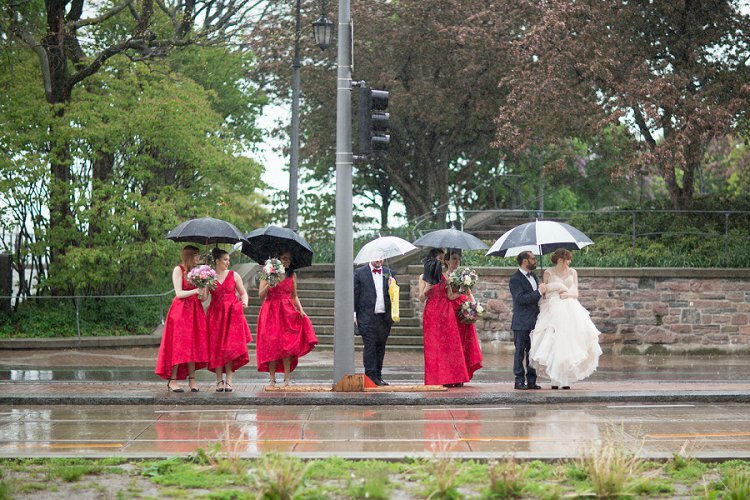 There was light rain on and off the morning of the wedding, but none right after the ceremony ended, so we all quickly hopped into two cabs for the 10-minute drive to the garden. We were lucky, we got about 30 minutes there before it started to rain on us, so we all opened up our umbrellas and ran across the street for shelter, which made for one of my favourite photos of the day, of Steve holding the umbrella over the two of us as we dash for cover. 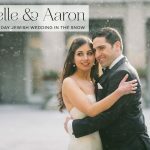 I’ve always loved taking, looking at, and arranging photos of family and friends, and the venue had a projector available, so I put together a slideshow that played in the background on a white brick wall. It included nearly 100 photos of me and Steve throughout our relationship, our parents, our wedding party, and other family and friends. It made me smile throughout the evening to look back and see a picture of my nephew’s first birthday, or Steve standing next to a bear statue at the zoo, or me and my maid of honour at our 16th birthday party, or some other fond memory. 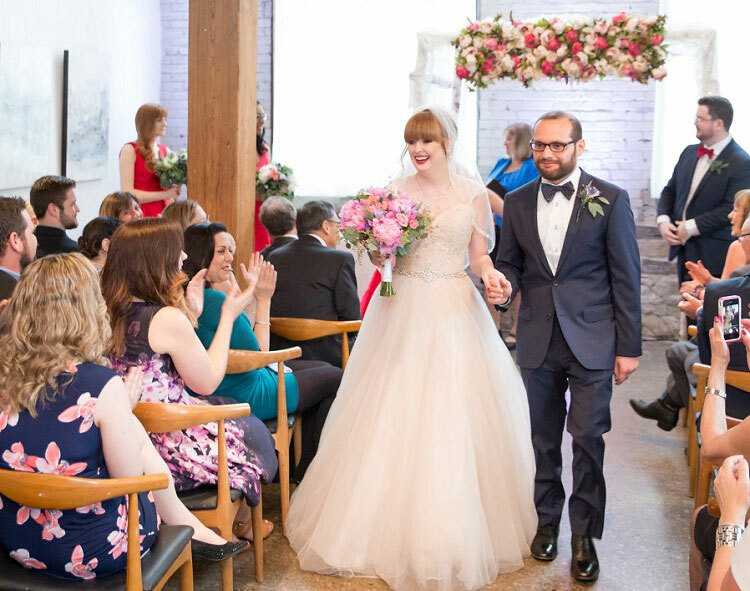 Something that was a huge help throughout the wedding planning process was a local Facebook group called Bunz Wedding Zone Toronto, which is now more than 6,000 members strong (and is listed as a “secret” group, meaning you have to be invited by another member to get in). 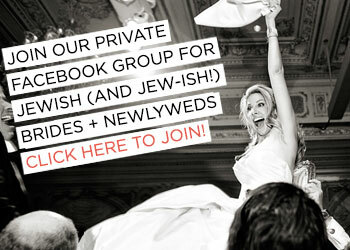 Not only did the people in this group offer me endless practical advice, but it’s also an active trading group, where I found everything from our table numbers to glass bottles for centrepieces, a gold picture frame for the seating chart, and a woman who custom-made my fingertip-length veil for me. 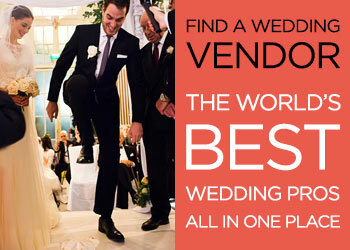 It’s a really special and supportive community that I recommend to anyone in the area who’s planning a wedding.